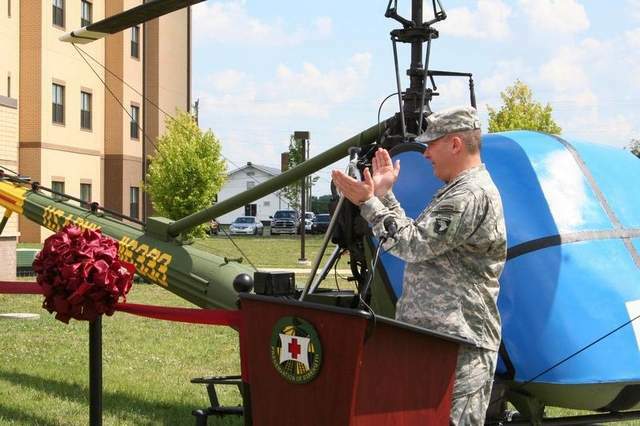 The Fort Campbell Warrior Transition Battalion in Kentucky is now the proud home of a Korean War-era Hiller OH-23 Raven medical evacuation helicopter. The U.S. Army’s Warrior Transition Battalion (WTB) leadership, along with the Blanchfield Army Community Hospital (BACH) commander and 101st Airborne Division leaders, dedicated the aircraft display at a ceremony in its new home at the WTB Complex today. During the ceremony, 101st Airborne Division (Air Assault) and Fort Campbell Senior Mission Commander Brig. Gen. Stammer recognized all of the men and women within the WTB, honoring them for their dedication to healing, overcoming personal obstacles and transitioning either back to their units or into the civilian world as honored veterans. For the complete story by Stacy Rzepka of BACH Public Affairs via The (Clarksville, Tenn.) Leaf-Chronicle, click here.